Biofertilizers are defined as preparations containing living cells or latent cells of efficient strains of microorganisms that help crop plants’ uptake of nutrients by their interactions in the rhizosphere when applied through seed or soil. They accelerate certain microbial processes in the soil which augment the extent of availability of nutrients in a form easily assimilated by plants. Very often microorganisms are not as efficient in natural surroundings as one would expect them to be and therefore artificially multiplied cultures of efficient selected microorganisms play a vital role in accelerating the microbial processes in soil. Use of biofertilizers is one of the important components of integrated nutrient management, as they are cost effective and renewable source of plant nutrients to supplement the chemical fertilizers for sustainable agriculture. Several microorganisms and their association with crop plants are being exploited in the production of biofertilizers. 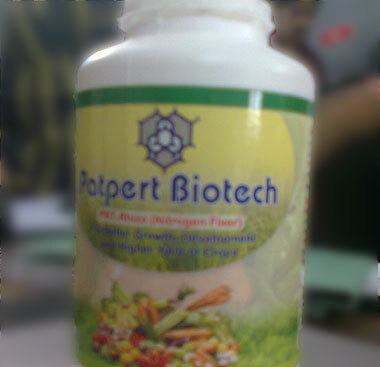 The following are the types of Bio-Fertilizers which Patpert Biotech wants to introduce in the vast Bio-Fertilizer Market by introducing them with their Generic names initially. After establishment of the products. Patpert can come up with some innovative product names related to the contents of the products and the crops for which it will be used to. Rhizobium is a soil habitat bacterium, which can able to colonize the legume roots and fixes the atmospheric nitrogen symbiotically. The morphology and physiology of rhizobium will vary from free-living condition to the bacteroid of nodules. They are the most efficient biofertilizers as per the quantity of nitrogen fixed concerned. They have seven genera and highly specific to form nodule in legumes, referred as cross inoculation group. rhizobium inoculant was first made in USA and commercialized by private enterprise in 1930s and the strange situation at that time has been chronicled by fred (1932). Initially, due to absence of efficient bradyrhizobial strains in soil, soybean inoculation at that time resulted in bumper crops but incessant inoculation during the last four decades by us farmers has resulted in the build up of a plethora of inefficient strains in soil whose replacement by efficient strains of bradyrhizobia has become an insurmountable problem. Of the several species of azotobacter, a. Chroococcum happens to be the dominant inhabitant in arable soils capable of fixing n2 (2-15 mg n2 fixed /g of carbon source) in culture media. The bacterium produces abundant slime which helps in soil aggregation. The numbers of a. Chroococcum in indian soils rarely exceeds 105/g soil due to lack of organic matter and the presence of antagonistic microorganisms in soil. Azotobacter is an aerobic soil microbe which facilitates nitrogen fixation. We have come up with a variety of Azotobacters which are playing a vital role in agriculture industry. These microorganisms are also used for biotechnological applications. Offered in liquid form, these are available in moisture proof packings. Several soil bacteria and fungi, notably species of pseudomonas, bacillus, penicillium, aspergillus etc. Secrete organic acids and lower the ph in their vicinity to bring about dissolution of bound phosphates in soil. Increased yields of wheat and potato were demonstrated due to inoculation of peat based cultures of bacillus polymyxa and pseudomonas striata. Currently, phosphate solubilizers are manufactured by agricultural universities and some private enterprises and sold to farmers through governmental agencies. These appear to be no check on either the quality of the inoculants marketed in india or the establishment of the desired organisms in the rhizosphere.